The bow tie is on its way back. Attempting to tie a bow tie is probably one of the most maddening feats of manual dexterity you may ever have to accomplish. How did our grandfathers do it? 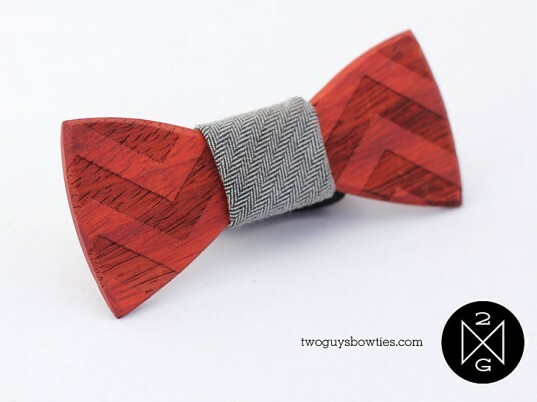 Avoid the frustration altogether by donning a handcrafted wooden bow tie from Two Guys Bow Ties. Always the perfect shape and size, each piece is made from exotic hardwood reclaimed from old flooring and furniture. From plain to polka dot and plaid, they are a unique cross between carpentry and fashion. Charlie Chaplin wore one. Winston Churchill wore one. David Beckham has even been spotted wearing one. The bow tie is on its way back. 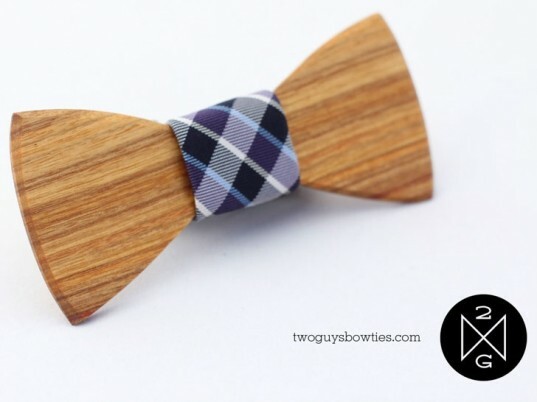 Two Guys Bow Ties offer a sustainable addition to the dandiest of closets with their collection of wooden accessories. Available in a number of patterns the ties are carefully crafted from recycled wood and fabric. Loving the statement that bow ties made, the designers were never quite able to find one that fit their style. “Using wood for our bow ties was a natural adaptation for us. We both have built things out of wood for years and it seemed like the perfect opportunity to use some sophisticated tools and techniques to create something we would love to wear. ” say founders Adam T. and Tim P.
Beginning at $45, the bow ties are available for order through their website. The Two Guys also offer custom accessories for weddings or special occasions. Why not branch out and add some wood to your wardrobe?